Two weeks before I retired, I was asked to go on one last business trip. A co-worker in another city would be taking over one of my duties, and I needed to spend a day or so showing her the ropes. Some of the work involved working from home and logging into the system using a VPN account. I brought my personal laptop with me to illustrate the process for her. I would grade my own technical skills with computers, tablets, and cell phones as a solid B. While I can’t do anything fancy such as designing web pages, I have an understanding of basic computing issues, and also how to troubleshoot and fix common hardware and software problems. Most important, I never thought I was anyone’s fool when it came to computer security — I am not that proverbial guy who writes passwords on sticky notes taped to his monitor. At one point during our training, sitting side-by-side with my co-worker, I managed to make her eyes bulge outward by something I did. I was explaining how we use a third-party system to get certain information. Unfortunately my attempts to access it kept failing. So I then proudly took out my smartphone, looked up the access code from a note that I had created, and then successfully logged into the system. “Sure do,” I responded proudly. It was at this point that I realized two things: (1) My younger and smarter co-worker was more savvy than me, and (2) I am a doofus. A day or two later, I read a very good article that explained just how easy it is to hack into someone’s cell phone, especially when you use public WiFi available at restaurants, waiting rooms, etc. Your browsing history, purchases, contacts, and e-mail were all there ripe for the pickin’. I really don’t use my cell phone as a computer; it’s really just a phone with extras to me. I also have one of the lowest data plans they offer. I do use text messaging when I’m out because it’s convenient (especially at the grocery store), and I also like to use free WiFi at places where I’m forced to wait for long periods such as at the airport. Clearly, however, I did make myself vulnerable with my iPhone notes. I had created notes for everything important, and nearly all of them included log-in information for web sites, my health insurance details (handy when I visited new doctors), frequent flier/hotel accounts, etc. My co-worker was correct in being shocked. I decided to attack this vulnerability with vigor. I went through the backups of my notes and printed them out. I also saved most of them to a large thumb-drive file and passworded it. If I’m smart I’ll remember to update this file in the future when the information changes. I also allowed some notes to remain on my phone — restaurants suggestions, the $10,000 piece of jewelry that Gorgeous once pointed out to me in a magazine, a list of pinot noir vineyards in Oregon, and a few other things that I may want to refer to while I’m out and about. But I kept nothing that could make me susceptible to identity theft. Still, I also wanted something easy and accessible when I did need important information. 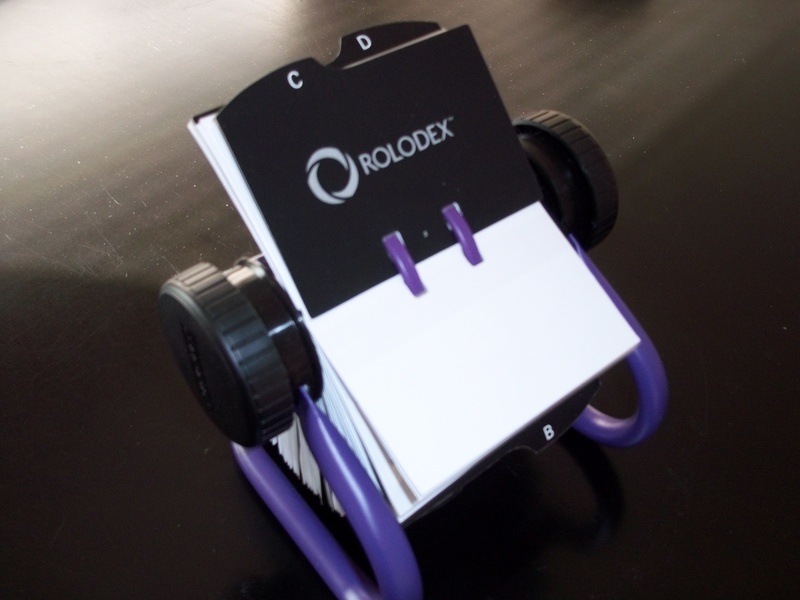 So, I went old school and decided on a rolodex. Yes, I’m still vulnerable were someone to break into our home. But I’m playing the odds on this one — I suspect it’ll probably be a thief under a certain age that doesn’t even know what one is. I’m positive of this because when we visited the nearby Staples, we looked high and low in their office supply area for a rolodex without any success. The piece de resistance was when I approached a bored, 20-something employee to ask him for help. “A rolo what?,” he asked. We tried explaining to him what a rolodex was, and the look on his face was similar to when I once tried explaining to a young nephew the Genesis eras of Phil Collins and Peter Gabriel. In a matter of minutes I was pretty deep in quicksand. It was ancient history stuff that only an archeologist could appreciate. Why, yes. Like an address book. So we took this young man’s advice. I ordered one on Amazon, and I now have a rolodex just like I used to have in my office. I have a spreadsheet with at least 30 different passwords (hopefully) coded in a way that wouldn’t make sense to anyone but me. Don’t know how computer makers expect you to remember many different passwords. Keeping info on a flash drive is a good idea. Oh, a spreadsheet is probably smarter. Mine is a large text file that I have to do a to find anything on it. Yours you can manipulate and sort. Smart woman!